In our house, fresh corn is THE ingredient of the summer. It’s sweet, packed with flavor, can be eaten raw or cooked and is extremely versatile. Any other time of the year in our house, dried polenta is a staple in our bulk pantry. It’s simple and it provides a heart base for any meal, but did you know you can make it fresh? Welcome to heaven. 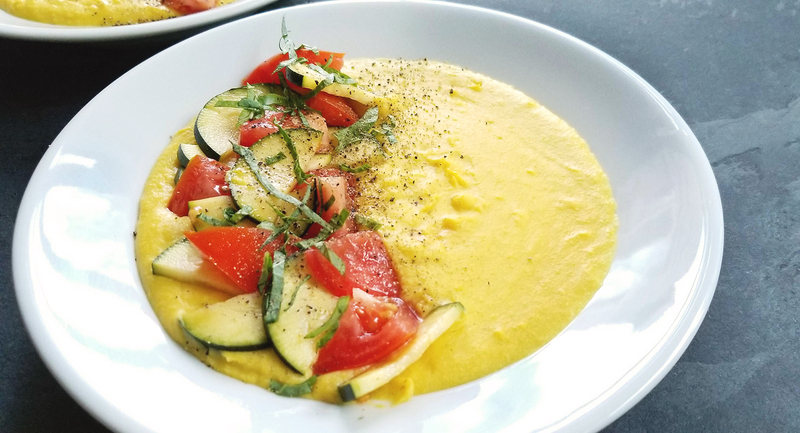 Polenta, made from dried cornmeal, tends to be more savory and plain since the dehydrating tends to remove flavor. 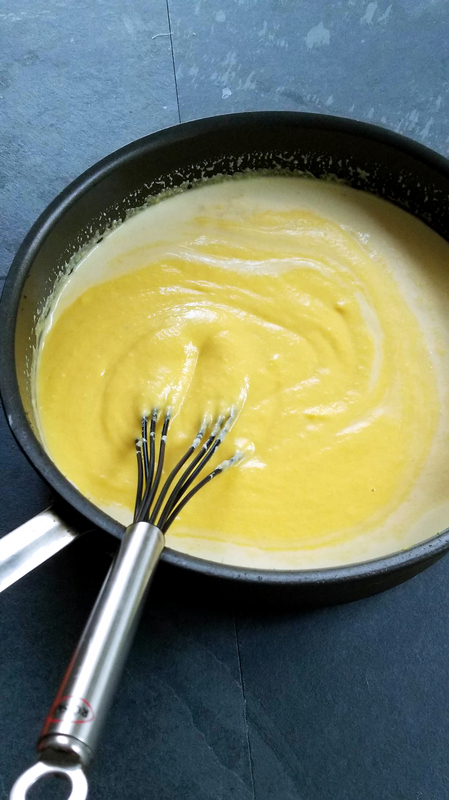 Making polenta this way relies on the flavor of the broth and add-ins ( like a ton of cream and butter) to bring it to life. And let’s not forget, it takes a long time to remove the “graininess” and make it really creamy. 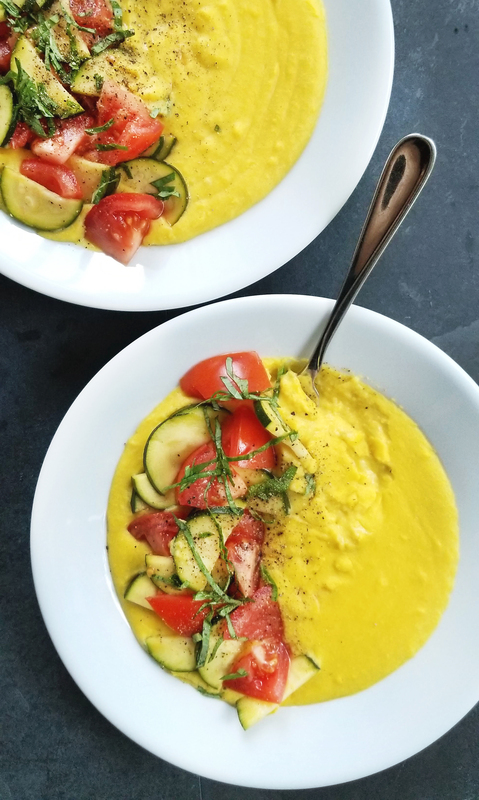 But, make polenta with fresh corn and you have a completely different, magical, sweet, and super creamy dish. The fresh kernels keep their sweetness, moisture, and starch making it the perfect combination for instant polenta. Most people only enjoy the kernels of fresh corn, which is a shame because the cob has so much flavor to offer. 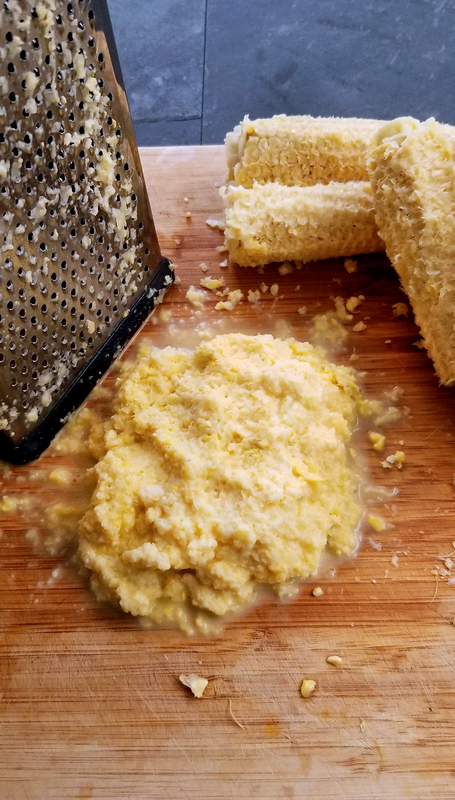 Using a cheese grater, you can “milk” the cobs once you have removed the kernels and get important corn liquid and starch that gives fresh polenta its structure, body, and more flavor. 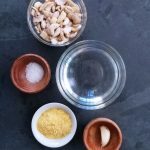 This dish can be made with just corn and the cooking liquid, but I decided to add a quick cashew cream to round our the flavors. The result? A quick, super creamy, sweet delicious bowl of goodness ready for any toppings you want. Because this dish tends to be on the sweeter side it pairs really well with foods that are braised, spiced, pickled, or acidic. In these pictures I added fresh tomatoes and quick picked zucchini, but you can do spicy roasted root veggies, marinara with vegan meatballs, coconut yogurt with fresh herbs and chili flakes…the possibilities are endless! 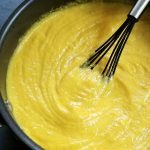 Ultra creamy and sweet fresh corn polenta. A perfect base for bright marinara, spicy vegetables, or pickled produce. Shuck and rinse the ears of corn. 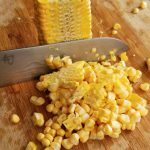 With a sharp knife slice the kernels off the cob and place into a large sauce pot. Next "milk" the cobs by running them down a cheese grater on the small grate, removing the remaining juice and meat until the cob appears dry. Discard the cobs. And add juice and meat to a food processor. Add just enough water to the sauce pot to cover the kernels. Bring the water to a boil, then let simmer for 10 minutes. Strain the corn, and keep 1 c. of the cooking liquid. Add the kernels, and corn juice/meat to a food processor and blend until smooth (this could take up to a minute, adding some of the cooking liquid if necessary). Return the corn puree to the sauce pot and add the cashew cream, and a generous amount of freshly cracked pepper. Cook over low heat and constantly stir for 3-5 minutes until it thickens slightly. Taste and adjust seasoning if necessary. Serve plain or with your choice of toppings. Fresh polenta is surprisingly SWEET, so toppings with acid or spice work great. 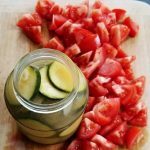 This can be fresh marinara, fresh tomatoes, herbs, pickled vegetables, or roasted spicy vegetables.